SSD (solid state drive) hosting services offers a much higher loading speed than other hosting services. The first SSD was launched in the ’50s. Since then, key IT collaborators worldwide have been improving and developing the initial concept. So in May 2005 Samsung, whose income were over 55 billion dolars has announced that it has enteres the market with a new SSD. A year later, in November 2006 Microsoft has announced the availability of the first operating system that included SSD management. 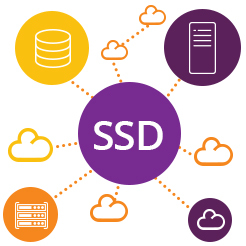 Our SSD hosting service is created for all customers who want a higher website performance, up to 300%. By using this service, bottlenecks in the operation website are removed. Speed is very important both in the offline and online environment and by choosing a SSD hosting package, your website will load in less than one second. A website that works perfectly all the time, attract more visitors and earn their trust.